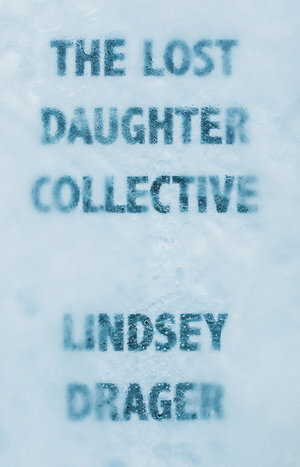 The Lost Daughter Collective by Lindsey Drager made me ache deep inside for all the daughters whose loss throbs in their families’ bodies. The gorgeous language and urgent, controlled voice spark a complicated and cerebral narrative that contains more layers with each re-reading. In Part I of the novel, the Ice Sculptor, an academic and a daughter, and her father, a Wrist Scholar, tell the story of members of the Lost Daughter Collective and the Fathers of Lost Daughters. In Part II, these members tell the story of the Ice Sculptor and her father. In an artist’s articulation at Dzanc Books, Drager writes that the M.C. Escher piece “Drawing Hands” inspired this structure. As the narrator says early on, “A daughter seems a simple thing. She bears purpose and potential, like a key or a road” (30). This simplicity deceives. Fairy-tale daughters, here, act as variations on the theme of “daughter.” Their collective girlhood reduces them to abstractions much as a news story might. The only character who seems to successfully find a lost daughter is the Ice Sculptor. Through the novel’s meta-narrativity—a passage near the end suggests that Peter, the leader of the Fathers of Lost Daughters group, wrote the entire book—the notion of singular authorship also becomes collectivized. Characters tell each others’ stories, and parts of the narrative are told through intertextual tales about lost daughters. Stories like The Wizard of Oz, Frankenstein, and Alice in Wonderland meld with tales about women authors like Virginia Woolf and Charlotte Perkins Gilman. The collectivity of the grief group narrative universalizes their experiences, and the shifting perspectives lend a kaleidoscopic, mythical quality to the narrative voice. One of Drager’s narrators writes, “The narratives are told in several voices, by clans of men everywhere, simultaneously, until they become synchronized myth” (16). While initially the members of the group seem defined by their professions (a rather Chaucerian approach), the narrator of the novel’s second half reveals the fathers’ full names and identities. Drager thoughtfully depicts inter-relationships in this group, including several queer relationships. This collectivity becomes circular, as images and themes recur and chapters end without definitive resolution. The image that ends the Ice Sculptor’s tale, of teeth in the bottom half of a mouth, recurs at the ending of the book, with an image of plastic chairs arranged in a circle. One member of the group does not have a dead or missing daughter, but rather a trans son. Drager’s handling of this transition narrative felt to me, a non-binary trans person, to be appropriate and thoughtful. Instead of the story focusing on the prurient elements of transition, which is often a pitfall of trans narratives, it focuses on the member’s emotional processing. Indeed, elsewhere in the novel Drager deftly handles changes in emotional tone, from the emotionality of a dead daughter to Nabokovian wordplay. Whether by paring a lengthy strophe down into a meaningful futuristic phrase or by finding mondegreens, Drager shows the deeper meanings not only of myths, but of words themselves. For example, the word laughter being nested inside of the word slaughter recurs. This sense of play extends to Drager’s exploration of the emotionality of academic theory. The boundaries of made-up academic fields, such as Room Studies, extend into the emotional intimacy of close family relationships. The Ice Sculptor crafts a theory called Cold Art Methodology whose seminal text ars glacerium closes with the line “Imagine a room full of daughters. How is it different than a room full of girls?” (25). Her father, a scholar of the human wrist, writes in Myth of the Wrist that “I have always believed that theory is not divorced from practice … We do not tell our stories to share—we tell our stories to warn” (12). Drager uses the novel to argue that theory and everyday lived experience are two stories always in the process of writing each other. The emotional resonance of Drager’s story is never overshadowed by the lyricism of the language, although there are moments where heightened lyricism recalls the fairy-tale mode of abstraction. On the whole, The Lost Daughter Collective serves as an excellent addition to the canon of modern fairy tales, exemplified in recent years by other texts such as the anthology My Mother She Killed Me, My Father He Ate Me and the literary journal Fairy Tale Review. This book is well worth your time and attention. I eagerly await Drager’s next book.